Florida Southern (2-0) picked up their second win of the GSC/SSC Crossover Challenge by a score of 79-74 over Delta State (0-2) on Saturday night in Jenkins Fieldhouse. The Moccasins were led by seniors Jonathon Lawton and Brett Hansen who scored 19 and 15 points a piece. Senior Slinky Jones and freshman Kai Cleary also added to the double digit club with 13 and 12 points each. The game started off very physical as both teams traded elbows as the Mocs opened a three point lead. This early lead was quickly overcome by Delta State as they went on a 7-0 run with 15:55 left in the first half (9-5). Florida Southern quickly brought it back to a tie game (9-9) before Delta State took the lead back and extended it to 6 (17-11) with 10:59 left in the half. This was the last time Delta State held the lead in the half as the Moccasins spent the next ten minutes disassembling the lead and taking control of the ball game. The Mocs eventually created a 10 point lead with 47 seconds left (39-29) before Delta State closed the gap slightly (40-33) heading into halftime. Slinky Jones came alive in the second half, scoring all 13 of his points. “I wasn’t as aggressive in the first half so I got a little down on myself and I told myself in the second half to just be more aggressive,” Jones said. Six of those points came in the first 51 seconds as Jones sunk back-to-back threes to build a game high 12 point lead. The lead was short lived as Delta State whittled it away to nothingness with 14:25 left in the game as they took a one point lead (49-50) before Brett Hansen took the lead back 13 seconds later. 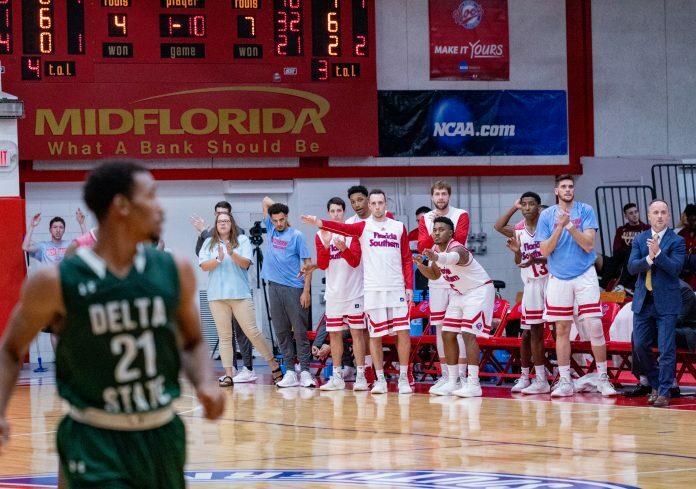 That was the only time Delta State led in the second half as Florida Southern slowly built up the five point lead that they finished with (79-74). 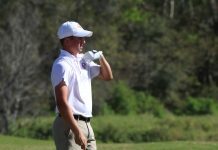 This is the first time at Florida Southern that Head Coach Mike Donnelly is 2-0 to start the season after this weekend’s wins against West Alabama and Delta State. This win extends the Moccasins’ series record against Delta State, which stretches back to 1982, to 6-3 and a 3-0 home record. 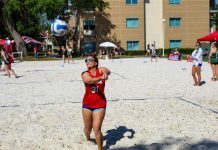 Florida Southern will play again next Saturday, Nov. 17 against Southern New Hampshire at 4 p.m. in Manchester, New Hampshire before returning home to play Merrimack College on Nov. 23 at 7:30 p.m.